Sinn Féin deputy leader Mary Lou McDonald will succeed Gerry Adams in spring or early summer of next year, according to The Irish News columnist Brian Feeney. The history lecturer believes the Dublin Central TD will assume the role in a political maneuver that has parallels with that which saw Fine Gael’s John Costello become taoiseach in 1948. According to Mr. Feeney, the manner in which Costello, left, took the Taoiseach’s role rather than the then Fine Gael leader Richard Mulcahy provides a precedent for the Mary Lou McDonald situation. 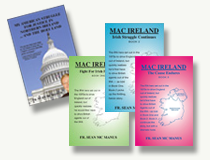 “Because of Mulcahy’s record in the Irish Civil War, when he ordered the deaths of 77 IRA personnel, he was seen as unacceptable to coalition partners Clann na Poblachta and its leader, Seán MacBride,” The Irish News columnist said. Mr. Feeney said there are parallels in the present day attitude of Fianna Fáil and Fine Gael to Sinn Féin. “After the transition at the top of Sinn Féin, Gerry Adams will still be a TD and still have power but it will save face for whoever the Taoiseach is in a coalition government,” he said. He said Ms. McDonald, who earlier this week told The Times newspaper that she has no desire to be “ordained” as her party’s next leader, would be appointed Sinn Féin leader in a “coronation” either at Easter 2018 or soon afterward.